With top athletes like Tom Brady and Aaron Rodgers touting the benefits of eating “almost vegan” and Serena and Venus Williams eating completely vegan, it’s clear that you don’t necessarily need to eat meat to build muscle or hit peak athletic form. But can a vegan diet help you lose weight? A vegan diet may even be better than other plant-based diets for weight loss, according to a 2015 study published in the journal Nutrition. Researchers put 50 adults on one of five low-fat, low-glycemic diets: vegan, vegetarian, pescatarian, semi-vegetarian, or omnivorous. After 6 months, people in the vegan group lost 7.5 percent of their body weight, while those in the other groups lost about 3 percent of their body weight. Meanwhile, an analysis of 12 studies found that people on a vegan diet lost 5.5 pounds more than those on an omnivorous diet. It’s worth noting that before you go on a vegan diet, it’s important to avoid common mistakes, like jumping into it overnight, not making sure you’re eating foods with key vitamins and minerals, and not eating enough protein. And remember: Giving up meat and dairy doesn’t make your diet healthy. Cookies, soda, potato chips, and other processed foods are vegan, too. You still need to make sure your plant-based diet is filled with balanced meals in the proper proportions. Now learn why — and how — going vegan can help the pounds fall off. That’s not all that fiber does. While insoluble fiber fills you up, soluble fiber is digested slowly, so it doesn’t spike your blood sugar the way simple carbs like pasta or cupcakes can. No sugar high means no sugar crash — or the resulting hunger pangs that can lead to mindlessly munching your way through an entire sleeve of cookies. Although you could overdo it on the cashew cheesecake and guacamole, a vegan diet is generally lower in fat — and therefore lower in calories since a gram of fat has nine calories and carbohydrates have four calories per gram. In a study published in Food & Nutrition Research, Danish researchers fed 43 healthy men a different breakfast on 3 separate days. Each breakfast included either a high-protein veal and pork patty, a high-protein bean and pea patty, or a low-protein bean and pea patty. The scientists asked participants about their hunger levels several times after breakfast, and then the men were allowed to eat as much as they wanted at lunch 3 hours later. The men not only reported that the high-protein plant patties were more satiating than the others, but they also ate 95 to 105 fewer calories at lunch that day compared with the other days. The study’s authors credit the combination of protein and fiber — the high-protein plant patties contained four times as much fiber as the meat patties. And speaking of protein and fiber (and other nutrients), Shakeology also comes in four vegan flavors: Chocolate Vegan, Vanilla Vegan, Café Latte Vegan, and Tropical Strawberry Vegan. You may recall mitochondria from high school science — these tiny structures in your cells convert nutrients to energy. But when you eat foods filled with unhealthy fats, some of that fat works its way into your muscle cells and gums up the works, Barnard says. On the other hand, a vegan diet may give your mitochondria a kick start: In 2005, Barnard placed 64 postmenopausal women on a low-fat vegan diet for 14 weeks. He found that, compared to women on a control diet, the metabolism of the vegan group increased 16 percent after every meal. This led to a one-pound drop on the scale every week, without exercise. It’s worth noting that fat is not your enemy; healthy fats (think avocado, seeds, and nuts) in reasonable portions are part of a balanced diet and can actually help you lose weight. 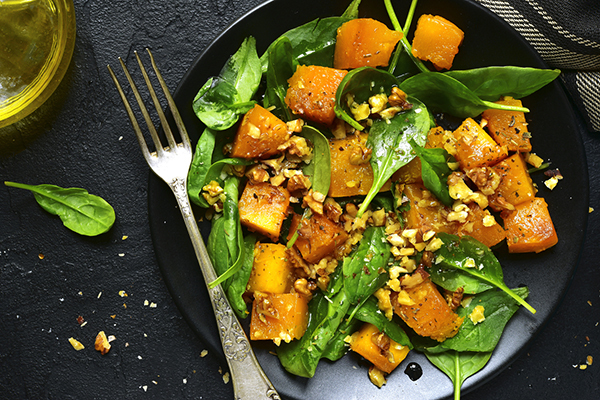 Some studies show that going vegan can keep your blood sugar level stable, which can help you manage hunger. “When you have high blood sugar levels after you eat but your insulin can’t get that sugar into your cells, your body thinks you’re still hungry,” says Brie Turner-McGrievy, Ph.D., R.D., author of the nutrition study mentioned earlier. “A working insulin system helps transport your blood sugar into your cells,” and that way your blood glucose stays on an even keel and your brain gets the “I’ve eaten” signal. If you ever switched from whole milk to low-fat, your taste buds probably revolted at first. But over time, you got used to the skim version and the whole-fat milk may have suddenly tasted too rich. The same thing can happen on a vegan diet since you’re eating healthier and lower-fat foods, Turner-McGrievy says. And when potato chips taste too fatty and salty, chances are you’ll naturally seek out healthier foods to nosh on, she adds. With a vegan diet, you may not only lose weight quickly, you also may be more likely to keep it off: “Our longest study was two and a half years, and the weight loss persists for that length of time,” Barnard says. It’s a lifestyle change many can continue for the long haul, even if they change to a semi-vegan diet, Turner-McGrievy adds.